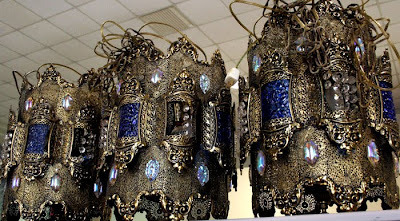 Based on overwhelming interest (OK, two people), here are more pics of the groovy Moroccan lanterns I dug out of a dusty abandoned cardboard box. They are currently stowed on top of my work cubicle. And the anonymous note left by a co-worker. Will you try to sell them? I think you could.. They are, indeed, very pretty, but I can see that they would be ... difficult to live with. hahahaha, that note cracks me up. nice. Haha are they serious with that note! 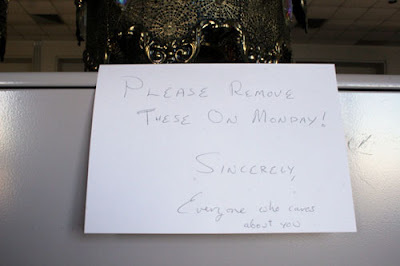 Reminds me of some chain mail i received once that was all these hysterical co-worker notes! 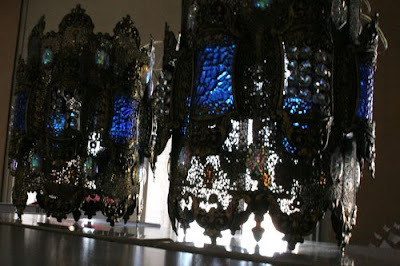 They're awesome, and I've long been attracted to Moroccan items but have been fearful of introducing such a distinctive look to my decor! Those are so amazing! Why would anyone want them to go away? I want more of them. I love them! If you sell them, let me know!